Whole chicken slow cooker recipes are great for busy moms and anyone else. The big advantage is that you can pop the poultry into the pot in the morning. When you get home in the evening, your meal will be ready to serve. To cook whole chickens, you will need one of the larger crockpots. 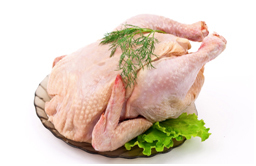 The right types of chickens to purchase are whole fryers or roasters. Either type will work. I have tried both and really cant tell the difference except that roasters are typically larger. Once you get the chicken home, you will want to remove it fromthe packaging. Take out the neck and the pouch containing the organs. I usually discard the neck and the organs, but some people use them for soups or stews. Rinse the chicken with water and pat it dry with paper towels. You can use a prepared rub for your whole chicken slow cooker recipes or make one with garlic, cayenne pepper, onion powder or any combination of your favorite spices. If you prefer, you can put the chicken in your pot and sprinkle on the spices. 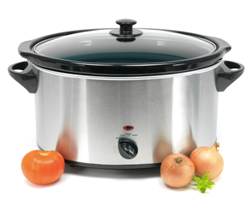 Put slow cooking vegetables such as celery, carrots and onions in the bottom of the pot. The chicken will sit on top of the vegetables. I usually pour in just enough water to cover the bottom of the pot. Some people skip the water because the broth and fat will drain from the bird to keep the veggies moist. Because of this some also like to set something like aluminum foil balls are a small metal rack that will keep veggies and poultry above the draining fat. Are Whole Chicken Slow Cooker Recipes Healthy? Overall, if you wanting crock pot healthy recipes, whole chickens are not your best choice. The legs, thighs and wings are high in fat. The skin holds fat against the meat, which is one of the reasons it turns out so moist. some kind of stew. Crockpot chili is easy to make. I often have all of the ingredients in my pantry. So, I dont have to go shopping when I am in the mood for chili. If you keep some of the basic ingredients on hand, you can come up with easy recipes for healthy meals on your own. Worcestershire Sauce and flavored Balsamic vinegars such as Fig make great marinades. I also use Allegro marinades a lot. Chili, however, is one of my favorites to make with lean ground beef, turkey or even white meat chicken for some White Chicken Chili! turn your cooker on low and in 5 hours or less you will be ready to eat! You can make whole chicken slow cooker recipes even healthier by either removing the skin or using the skinless breasts. For Fit Kitchen Tools, click here.